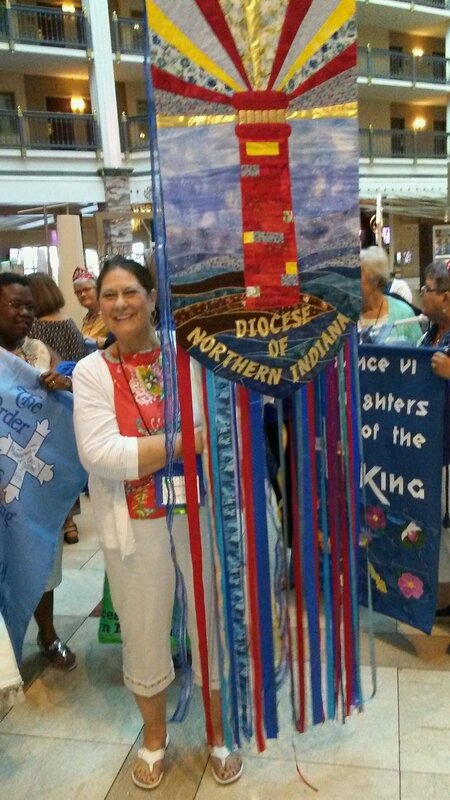 Celeste Hilliard, of the Cathedral of St. James, processing the Northern Indiana DOK banner during the Opening Eucharist of the DOK Triennial. Going to any convention for the first time is a little daunting. I flew in to Austin, Texas, all by myself and did not know the routine. However, it all suddenly became clear and welcoming. At baggage claim, other Daughters of the King met me and directed me to the cab area where I met other Daughters headed to the same convention. At the hotel, the familiar DOK cross was almost every where I looked. In fact, those who were not Daughters were in the minority, and calm set in. My new roommate’s friend said it best, “There were no strangers, just friends you haven’t met.” They were both first time participants, as well. The Triennial, the national convention of The Order of the Daughters of the King, was a wonderful experience. The workshops proved informative, the speakers generated excitement, the powerful presentations of the International Daughters made them real with faces, names, and personalities, and the Junior Daughters thrilled me with their innocence and youthful dedication to our Lord Jesus. I have worked for the Order at the chapter and diocesan level, but not until I attended the Triennial this year, did I have a complete understanding of the magnitude of the Order to which I belong. It is awesome and humbling to realize that I join thousands of women from all over the world who live by the same Rule of Life and Rule of Prayer that I attempt to follow. Our love for Christ binds us together as one. I left Triennial with a renewed energy for our Order at all levels. Kathy Schultz, Province V president, told me, “It may be your first Triennial; it won’t be your last.” She was right.